We decided to drive down to Salida from Denver on Friday night, after work. We heavily debated camping, but the appeal of indoor plumbing and a bed outweighed the desire to pitch a tent in the dark, so we "camped" at the Days Inn on Highway 50 (not bad, but not the Ritz Carlton). We drove through a tumultuous electrical storm on the way down...not a good sign. Saturday morning, we awoke and headed out around 6:15am. The initial dirt road to the trailhead was fine, but once we hit County Road 252, the road got rougher. My Honda Accord probably could've made it fine, but I was thankful that we took my wife's 4WD Toyota Tacoma. We never needed the 4WD, but the road was rough enough to warrant a more hardened vehicle (still, this road was much better than the one heading up to Grays and Torreys). We arrived at the trailhead about 6:45am, and there were maybe a dozen other cars parked there. The sky was a nice clear blue and the sun was shining - it seemed like we would have a nice day of hiking in front of us. 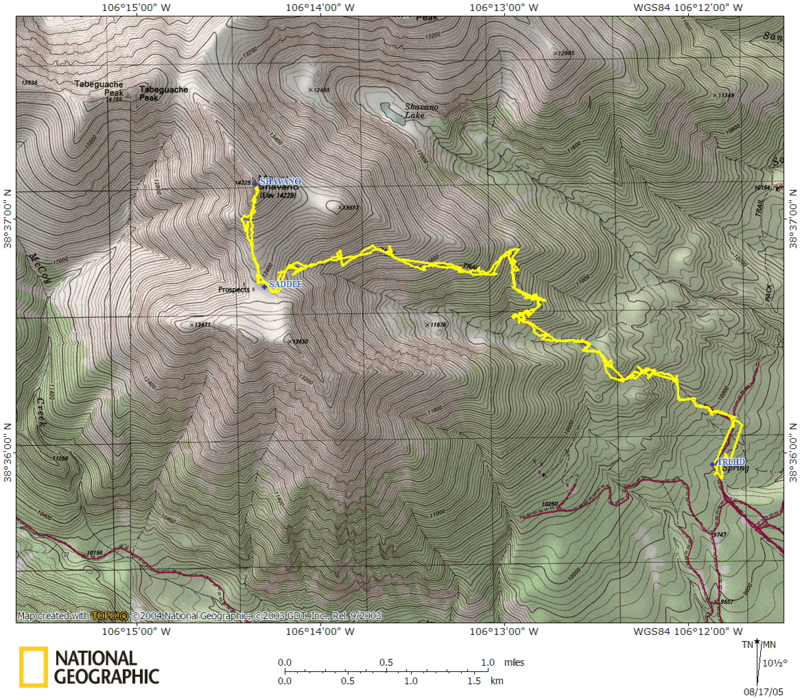 We started up the Colorado Trail piece of the track, splitting off to the Shavano trail about ¼ of a mile later. The nice thing about the Sawatch Range is the quietness it provides - compared to the Front Range or Ten-Mile 14ers, Sawatch tend to have far fewer hikers on them. We maybe saw 30 people on our entire hike. The trail was a nice and wide, with a gentle uphill slope, wandering through a heavily forested region. The biggest irritation was the medium sized rocks that littered the trail randomly, making steps a little more tedious. This ended up being much more of a hassle on the way down when our legs were tired. The trail wandered pleasantly through the forest with a fairly constant grade with maybe 2 minor stream crossings (by log bridge, or by a hop). As we reached tree line, the larger trees started to disappear, and all that was left were oddly shaped Bristlecone Pines that looked quite interesting. At tree line, we could see a peak, but knew it was not the real summit, so we continued up to the saddle point. In the push to the saddle, the grade was a little steeper, and of course the air a bit thinner, so our pace slowed a little. We gained the saddle at about 10:00am. As we were hiking up to the saddle, clouds started to drift upwards from the valley below and waft around us, creating an eerie feeling. Looking back, the town of Salida, indeed the entire valley, was not visible. A layer of clouds had settled in below, and they appeared to be rising up as well. On the west side of the saddle, we could see lots of other clouds drifting around aimlessly. We had intended to proceed on from Shavano to bag Tabeguache as well, as they are connected by a mile long ridge; but this requires you to re-summit Shavano on the way back. Given these conditions, one must pay a lot of attention to the weather, as there is nowhere to hide up there! From the saddle, we still had about 1000 feet left to the summit. The solid trail we had so far just disappeared and we were forced to pick one of the many climbers' trails that wended its way up through the talus towards the summit. There were plenty of trails to follow, and the boulders were spaced far enough apart that they were very easy, it's just that your creativity in route-finding I believe is inversely proportional to the amount of air you have. The push to the summit took longer than we expected. It didn't seem all that far from the saddle point, and I believe that the true summit was somewhat hidden from view from the saddle by the ridge it was along. Anyway, we summited around 11:00am, and there were two other groups of hikers up top. Briefly, we could see the summit of Tabeguache through the clouds. There appeared to be maybe a dozen people on that peak. Now, as most people know, lightening is really the only danger on most mountains in Colorado (well, aside from falling, etc.) Hikes need to be planned so that you are off the mountain (or at least the summit) by noon, typically because electrical storms tend to arrive in the afternoon (although that's not a hard and fast rule...they can come early). If you can hear thunder on a peak, you should be going down, not up; and if you can feel static electricity, you NEED to get down. I've had one close enough brush with lightning to know that I NEVER want to be in a storm like that again (there weren't just a few strands of hair standing on end there - it was an entire head of long hair on end). After the other group noticed the static, everyone on the summit knew it was time to get down FAST. Some of the hikers said they could here a buzzing sound, which is also a good indicator that lightening is imminent. 10 minutes after we summited, we quickly headed down the mountain (probably the shortest time we've ever spent on a summit). As we raced down the mountain (electricity is a great motivator to get your pace up! ), we informed everyone that we encountered still heading up of the electrical conditions. Some decided to keep pressing on, while others wisely turned back. Once back on the saddle around 11:40am, the other hikers' hair seemed to have relaxed, which is a more comforting sign. By this time, the clouds had solidified from many separate blobs into one giant cloud that enveloped the entire mountain. We descended down from the saddle into a dense fog of clouds, where visibility was maybe 30 feet. Not long after we hit the saddle, we heard a crack of thunder on the other side of the ridge. It sounded maybe a mile away, and we were quickly dropping down away from it, but it confirmed that we had made the right decision. As we descended, we were followed by everyone that was on the Shavano summit with us, and eventually those that had cleared of off Tabeguache too. Only a few hikers were still ascending, and most of them turned back when they heard the thunder. Upon reaching tree line at about noon (around 12,000 ft), we relaxed a bit - the worst threat was over. The fog broke up a little as well, yielding much better visibility. We continued to trek down the mountain, not realizing exactly how far up we'd hiked. Occasionally, we'd hear rumblings of distant thunder, so it didn't sound like the storm we'd started to experience up top ever materialized locally (which is a good thing). About 1:00pm, it finally started to lightly rain. We finally made it back to the trailhead about 2:15pm.